The Buck 110 traditional folding knife has been one of the best selling knives ever produced and has earned a place of honor in the knife world. Solid Buck craftsmanship that knife enthusiasts have come to appreciate the knife's design and construction. The 420HC blade is ready for any task. 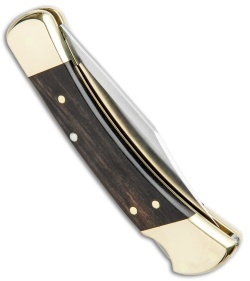 The brass bolsters are accented with Ebony scales on the 110's handles. Comes with leather sheath and is new in box. 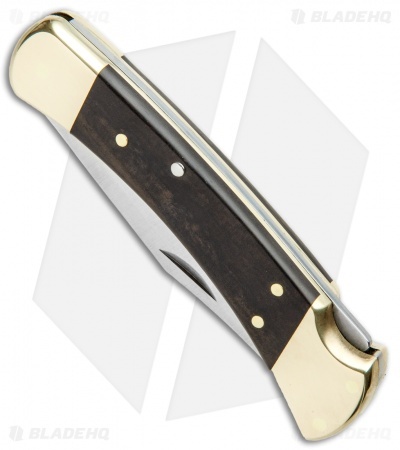 The Buck 110 will forever be known as a traditional knife staple. The folder is a really nice looking blade. Hold a decent edge, you can not keep the nice copper color but is ok for me. IMO is not an EDC knife, because is huge and heavy as hell. If you dont know it...try it first from a friend before you buy it online. The sheath is going to put marks on it, ( Inside the sheath, behind the button and behind the loop seams). But over all is a great knife to have. my grandpa got one in the 70's and still is sharp and the lock is still the strongest I've ever seen. 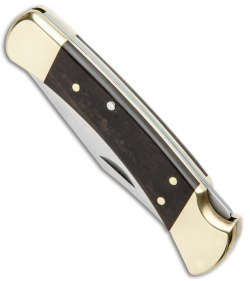 You can't call yourself a knife guy if you don't own a Buck 110. One of the most classic designs out there. 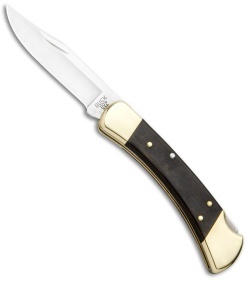 When it's open it feels like a fixed blade because of how sturdy of a knife it is. Great knife that stands the test of time. There’s a reason this knife is still popular and loved. Mine came razor sharp And a great lockup . the knife reminds me of my grandpa who carried a buck while being a police officer in the 70s now i have mine and his . just a great knife. 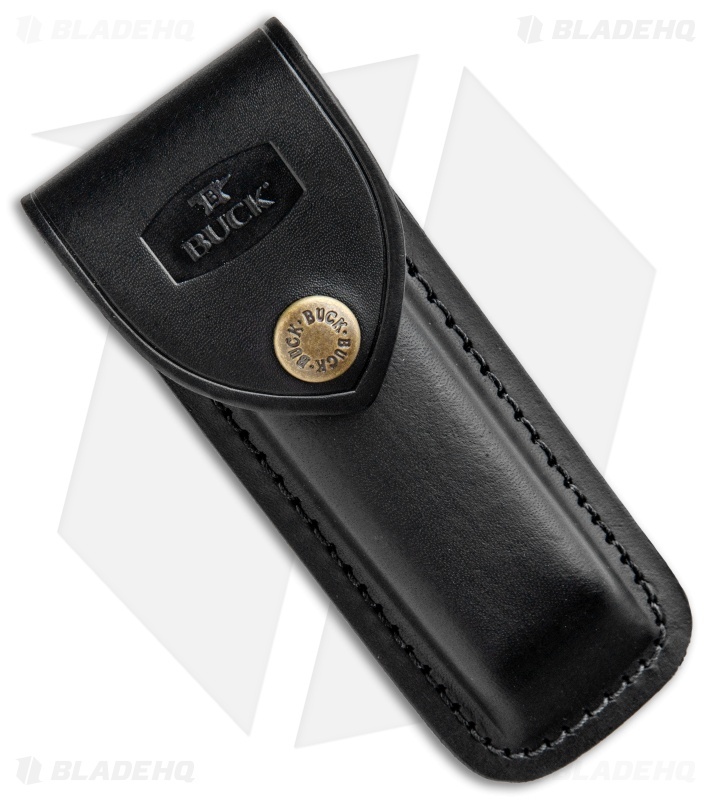 A must for any knife collector or anyone looking to get the ultimate workhorse. It’s a little heavy but it’s built solid. This is a truly iconic knife. It's a large gentlemen's-esque folder, but in my mind it is for very specific applications. In my opinion, it's best suited to be clipped to a belt. It's very heavy and will weigh down your pocket. I've had high end Spydercos and Benchmades, and the factory edge on the 110 is on par with those manufacturers. I was doing a wood carving with this knife and slipped, required 3 stitches on my left index. Buyer beware, it comes sharp. Have had a hand me down 110 for years and thought id buy a new one. Purchased from blade hq and always super fast shipping and always know Im getting the real deal. Always afraid to buy from places lime amazon kr ebay afraid get cheap knock offs. Anyways the new 110 is even more remarkable than the old one ie been useing for years. Arrived razor sharp flawless right outta the box and i realy like the leather sheath. I cannot see giving this knife anything but 5 stars. It's an American icon. 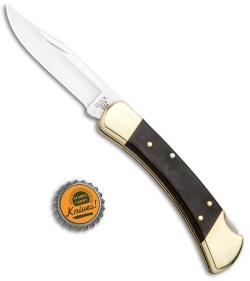 Anyone who hunts, collects knives, or is even mildly interested in knives knows this knife when they see it. Typically, their response is positive, like "ohhh nice knife...classic". It's such a solid design and it's so tough. I grew up watching my father use one, and I had to have one for myself. Beautiful knife that ages very well. 56 years ago at age 11, I bought my first 110. I managed to break the spine doing farm work. I put it away and forgot about it for over 50 years. I contacted Buck and they replaced it, no problem. That is a great warranty! The Buck 110 is an endearing hallmark of the Buck Knives company. My father had one, and now I own one. Pros: Price, good materials, strong lock, nice grind and very sharp and acute point. Cons: Bulky, heavy, brass gets dirty.